The figure below contrasts the protocol that powers the web, http, with the protocol that powers the internet of money, bitcoin. 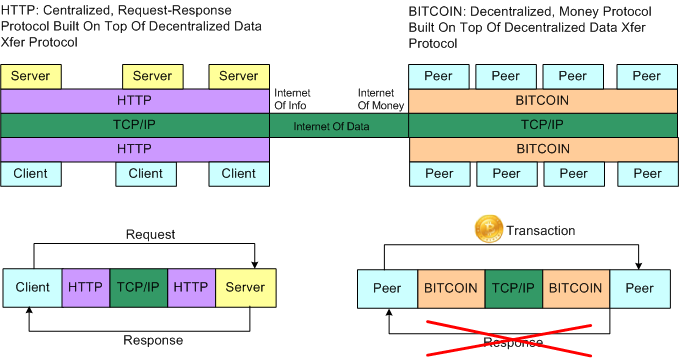 Unlike http, bitcoin is both a protocol and a form of money transported via that protocol. Bitcoin-the-currency and bitcoin-the-protocol are inseparable – they’ve been purposely fused together into a brilliantly elegant and groundbreaking monetary system. Note that http is a centralized, client-server protocol built on top of a decentralized protocol. On the other hand, bitcoin is a decentralized, peer-peer protocol built on top of the same decentralized protocol as http. 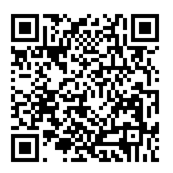 Http transports abstract information. Bitcoin transports less abstract (but still abstract) virtual currency. With the centralized http protocol, clients are at the mercy of those who own and control the servers that those clients issue “requests” to – those servers can be malicious. In addition, http server owners can go bankrupt or have their servers shutdown on the whim of “authorities who know what’s best for all” – taking whatever information or assets you thought you owned residing on those servers away from you. Since bitcoin-the-protocol is decentralized, it can’t be “turned off“; just like the internet can’t be turned off. However, the possession and use of bitcoin-the-currency can be outlawed by governments if they decide that it’s a threat to them (behind the guise of “we know what’s best for all“). In addition, centralized client/server systems built on top of bitcoin-the-protocol, like currency exchanges and/or commerce sites that accept bitcoin, can be shuttered. But, with bitcoin-the-protocol, the cat is out of the bag. No matter how many “Silk Road” web sites get shutdown or how many “Mt. Gox” BTC exchanges go bust, you and I, as peers, will always be able to transact in bitcoin-the-currency over bitcoin-the-protocol.